When I was driving en route home from San Antonio back to Virginia in early August, I stopped to visit my friends Sue and Steve in Huntsville, AL. Sue took me back to the Indian Creek Canal to shoot some photos of the beautiful koi with my iPhone 8Plus. I went a little crazy, running back and forth to capture these images (especially following the beautiful gold koi)! The canal was the first one in Alabama, incorporated in 1820 and completed in 1931. It was constructed to the Tennessee River to facilitate the transportation of cotton to market. Developers were Thomas Fearn, LeRoy Pope, Stephen S. Ewing, Henry Cook, and Samuel Hazard. On our last night on the long road from San Antonio to Virginia, we spent the night with our friends, Sue and Steve, in Huntsville, AL. We arrived at Sue’s house at almost midnight and set the alarm to get up by 6:30. 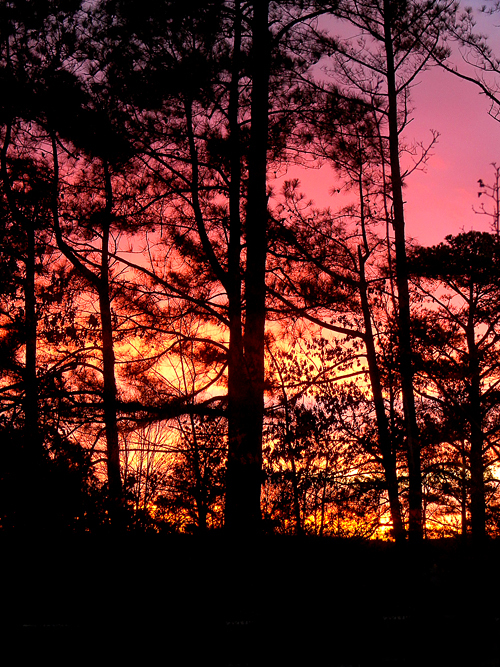 I really didn’t want to get out of that comfortable bed, but when I caught a glimpse of this gorgeous pink and yellow sunrise from the guest room window, I was propelled out of bed to get this shot. Who needs sleep when there are scenes to record like this? I shot this photo below of the restroom hallway in Longwood’s new East Conservatory Plaza. 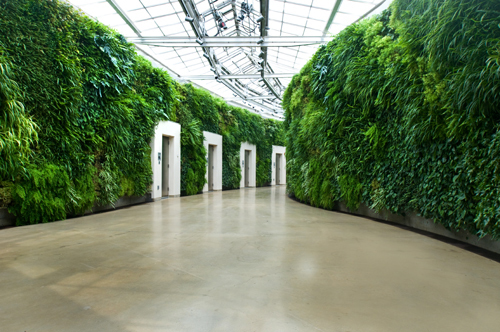 It is the largest “living wall” in North America, and was designed by famed British landscape architect Kim Wilkie. This is the first time I’ve seen a living wall planted with ferns and other greenery (28 plant species and 47,000 plants in total! )—rather than succulents. (I blogged here about the gorgeous living wall of succulents on the facade of the Anthropologie store in Huntsville, Alabama). Watch the video below to see how the project came together and see the Longwood Gardens blog here for more information. Michael and I ventured out to the Mount Vernon Parkway before 7:00 p.m. this evening to scout out a good spot to wait for the much-anticipated and much-heralded “Supermoon.” I’m sorry to have to report that I was a tiny bit disappointed. I confess that I was hoping for that end-of-the-world-large-encroaching-orb-could-swallow-us-whole-fodder-for-a-science-fiction-movie effect, but it didn’t happen. Yes, it was a lovely moon—slightly larger than usual and a bit brighter. I guess I was expecting it to flood the horizon so fully that I would have to take off my Nikkor 80-400 zoom lens and put on the 50mm just to catch it all in my viewfinder. So large that I would hear audible gasps from the neighboring photographers, then perhaps we would spontaneously hold hands and break into song (Kumbaya, perhaps?). Didn’t happen. The moon I photographed in Huntsville, Alabama a few years ago seemed a whole lot larger and a lumen or two brighter than tonight’s “Supermoon.” You can view that posting here. I was, however, taken in by the sunset’s show earlier. Hey! Guess what? I was just ready to publish this post and decided to Google this search: “supermoon was disappointing tonight,” just to see if anyone had the same reaction that I did. Why do I find this so interesting? Well, I photographed that moon near the Huntsville Airport in December 12, 2008! So my eyes (and my memory) did remember a more impressive sky that night than tonight. Unlike tonight, I wasn’t even hunting for it —my friend Sue had picked me up from the airport and I asked her to pull over so I could get a few shots of the spectacular moon! Who would have thought that the moon being only six miles closer to the earth would make such a noticeable difference? After the Hearing Loss Association of America Convention was over (click here for details), we headed toward Huntsville to visit our friend Sue. We wanted to show my sister the nearby towns of Franklin and Leipers Fork en route and we just had to stop to photograph this adorable baby donkey. He (she?) came right up to us to get some attention. I shot the image of Michael petting it to show you how small this little guy was. I’m not sure (yet) what kind of flowers these are, but they’re shorter than the newly-identified Wild Turnip flowers I photographed in rural Virginia on my road trip. This photo was shot just outside of Huntsville, when Sue and I were en route to Arkansas on Monday to visit her Aunt Gay in Little Rock. The flowers could be Wild Mustard or some kind of buttercup. Help in identification would be much appreciated!